Viruses are submicroscopic particles of DNA or RNA that can cause disease in plants. They can grow and reproduce only inside a living plant cell. 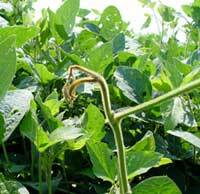 Virus-like symptoms have been increasing in midwestern soybean fields in recent years. Mottled, crinkled leaves during periods of rapid growth, mottled seed, and lower than expected yields can be possible signs of virus infection. The impact and management of soybean viruses in the midwest is currently an active area of research. Unlike other soybean pathogens, which are spread by wind, water, soil or plant debris, most plant viruses are spread from plant to plant by specific insect vectors. The insects that most commonly transmit viruses in soybean are bean leaf beetle (Cerotoma trifurcata), the soybean aphid (Aphis glycines) and other migratory aphid species, and thrips. Recognizing the virus as part of a unique plant-insect-virus relationship is the key to effective management. Bean pod mottle virus (BPMV) and Soybean mosaic virus (SMV) have historically been the most important viruses in the north-central region. 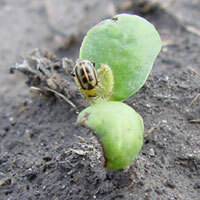 However, recent surveys have identified the presence of several other viruses, including Alfalfa mosaic virus (AMV), Soybean dwarf virus (SbDV), Soybean vein necrotic virus (SVNV), Tobacco ringspot virus (TRV), and Tobacco streak virus (TSV) in midwestern soybean fields. Viruses have been identified in symptomatic and nonsymptomatic plants, often in dual or multiple infections. Multiple infections pose the greatest risk of reduced quality and yield. 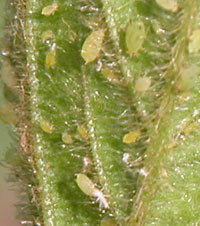 Alfalfa mosaic virus is transmitted by several aphids species, including the soybean aphid, and also through seed. Alfalfa and clover plants in the region are commonly infected with AMV. 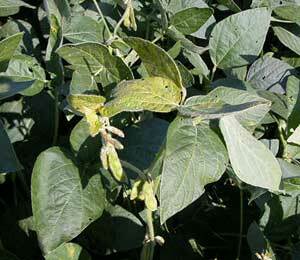 Symptoms of AMV tend to decrease as the soybean plant matures. BPMV is the most common and widespread viral pathogen of soybean in the region. 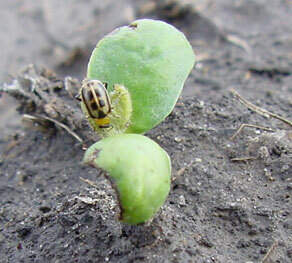 BPMV is transmitted by leaf-feeding beetles, primarily the bean leaf beetle Cerotoma trifurcata. The incidence of BPMV infection in soybean fields can be very high in years when overwintering bean leaf beetle populations are high. Milder winters are thought to be contributing to regular high overwintering populations of the beetle. 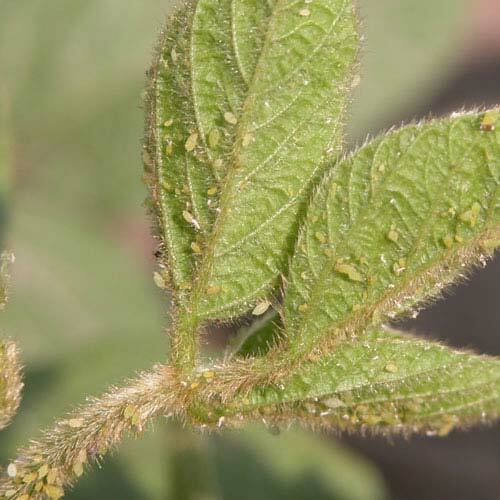 Soybean mosaic virus is transmitted through seed at rates ranging from 0 to 5% in most commercial varieties, and by several species of aphids, including soybean aphid, Aphis glycines. The incidence of SMV infection in soybean fields has been much lower than that reported for BPMV. However, yield losses from SMV infection in the region have been as high as 94%. 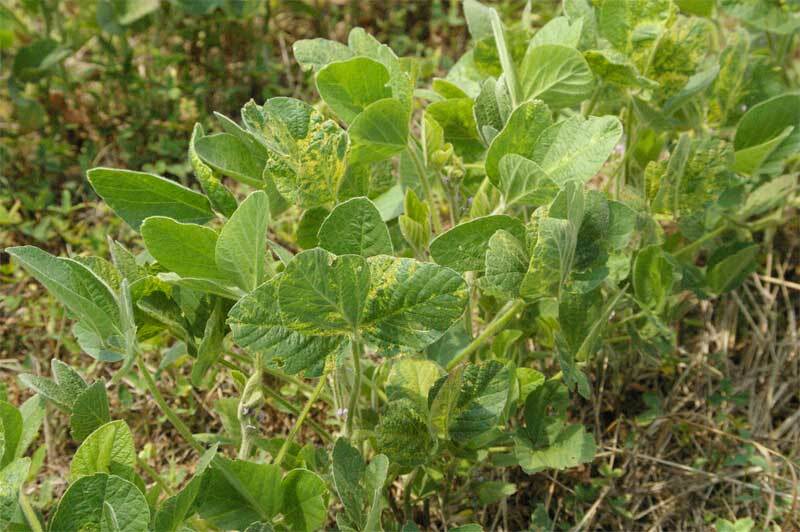 When soybean plants are infected with both BPMV and SMV, symptoms can be more severe than infection by either virus alone. 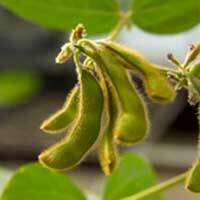 SbDV causes severe yield losses in soybean in Japan. SbDV has been detected in more than 40% of red clover plants sampled in Illinois, and has been consistently detected in commercial soybean fields in both Illinois and Wisconsin. Although SbDV has been shown to be transmitted by soybean aphids, the SbDV incidence in Illinois and Wisconsin have not been correlated with annual aphid abundance as determined by the North Central Regional Soybean Aphid Suction Trap Network. 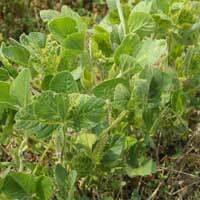 Of the many diseases caused by TRSV, budblight of soybeans is one of the the most severe. In general, most significant yield loss occurs when plants become infected before flowering. Several insect vectors have been reported, including aphids Myzus persicae and Aphis gossypii, grasshoppers, the tobacco flea beetle, and thrips. 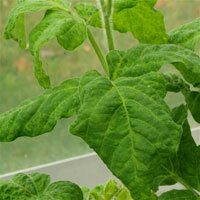 Tobacco streak virus is transmitted by thrips, and through infected soybean seed. It is capable of reducing yield. TSV infection can be difficult to detect because the concentration of TSV particles decline significantly as soybean plants mature. Watch for early virus infections in fields with moderate to high feeding by aphids, thrips, or bean leaf beetles. 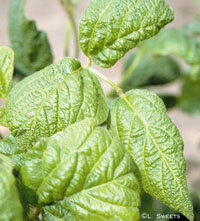 Presence of leaf symptoms: mottled, crinkled leaf symptoms typical of virus infection. 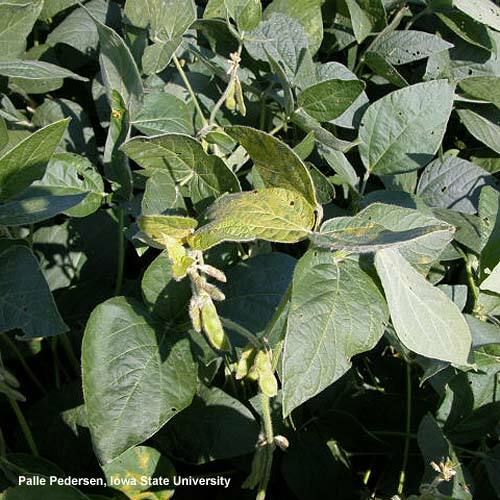 Be aware that leaf symptoms are not a consistent indicator of virus infection -- weather conditions and growth stage can mask leaf symptoms, and soybean varieties will differ in the amount of leaf symptoms that develop. Mottled and crinkled leaves can have other causes, such as herbicide injury or nutrient deficiencies. Most virus-infected plants have fewer pods, lower-than-expected yields and are stunted to some degree. Pods may be flatter and smaller. Different viruses can cause similar symptoms, and infection by more than one virus is common. Virus-infected leaves may show a mosaic of light and dark areas. Leaf margins may curl downward.Foliar symptoms of virus infection will be most apparent during times of rapid growth and cooler weather. Sometimes foliar symptoms resemble injury from herbicide drift. Photo credit: Melvin Newman, University of Tennessee. Click on image to view an enlargement. A curving of the terminal bud on the main stem, forming a "shepherd’s crook", can be a symptom of Tobacco ringspot virus infection. 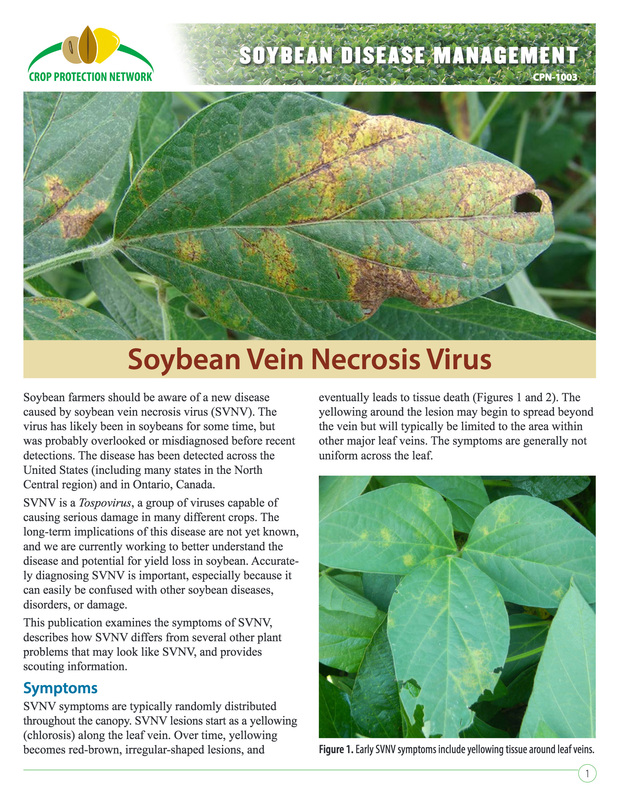 Symptoms of virus in soybean - Photo: Iowa State University - Click on image to view a larger version. Virus diseases can cause significant yield reductions, decreased pod and seed set, and quality of yield; reduced oil content and more seed discoloration. 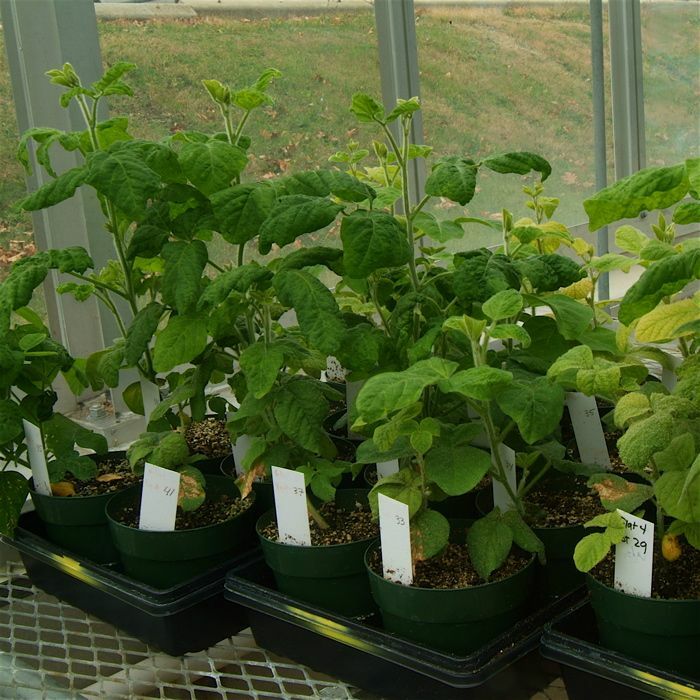 The impact of the more recently detected soybean viruses, such as the Soybean dwarf virus, Tobacco streak virus, Soybean vein necrosis virus, and Soybean yellow mottle mosaic virus on soybean production is not yet known. Mild winters over the past decade have allowed bean leaf beetles to overwinter and immigrate into soybean fields at unprecedented levels. This has correlated with very high incidences of BPMV early in the growing season when soybean plants are most sensitive. Even though the severity of BPMV-induced symptoms declines as plants mature, yield losses of up to 52% have been reported on southern germplasm from BPMV-infected plants. Yield losses from SMV infection have been reported as high as 94%. 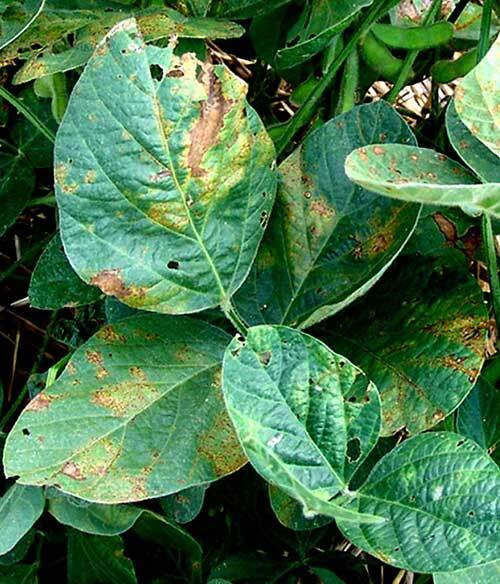 When soybean plants are infected with both BPMV and SMV, symptoms are more severe than infection by either virus alone and usually results in complete loss of yield. 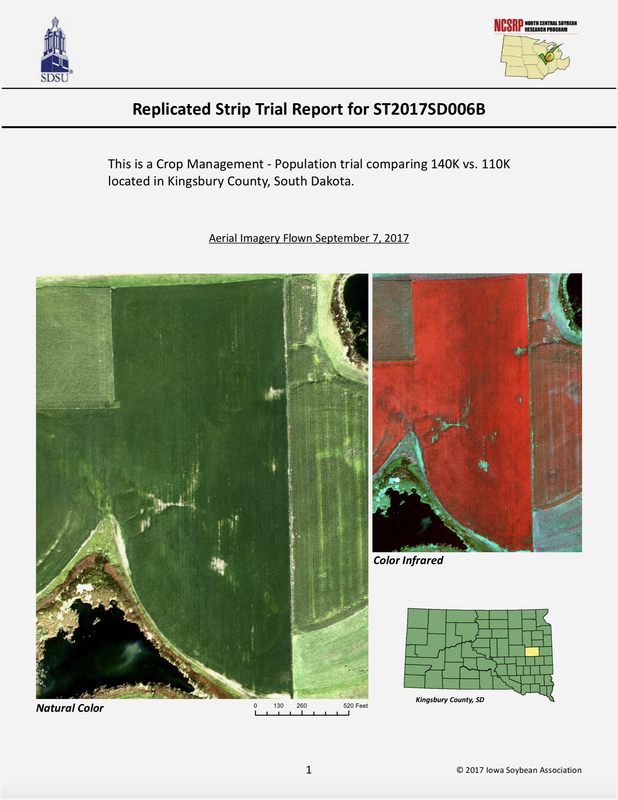 In yield trials in Wisconsin, AMV infections resulted in yield losses of up to 48% (Mueller and Grau). 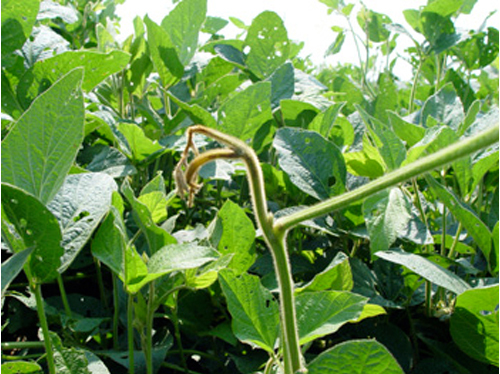 In yield trials, TSV can significantly reduce soybean yields, but the source of the virus and its impact on commercial soybean production are unknown. 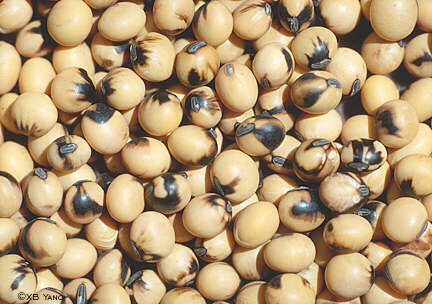 Almost all soybean varieties tested have been susceptible. Late planting - coincides with higher populations of the soybean aphid and increases the probability of virus transmission to young seedlings. Presence of leaf symptom such as mottled, crinkled leaves on the newest growth. Soybean varieites can differ in their response to soybean viruses.The Illinois Varietal Information Program for Soybeans rates reactions of commercial soybean lines to infection by SMV each year. 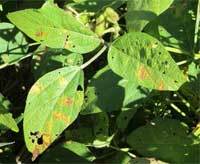 There are no specific recommendations available yet for consistent, effective management of soybean virus diseases. The most effective strategy to limit losses from virus diseases is to select soybean varieties that are resistant to or tolerant of virus infection. It is known that soybean lines and varieties currently grown in the north differ in their response to SMV and other viruses, and that some varieties have significant tolerance to certain viruses. Although progress has been made in quantifying field tolerance to soybean viruses, information on specific varieties is not always available. 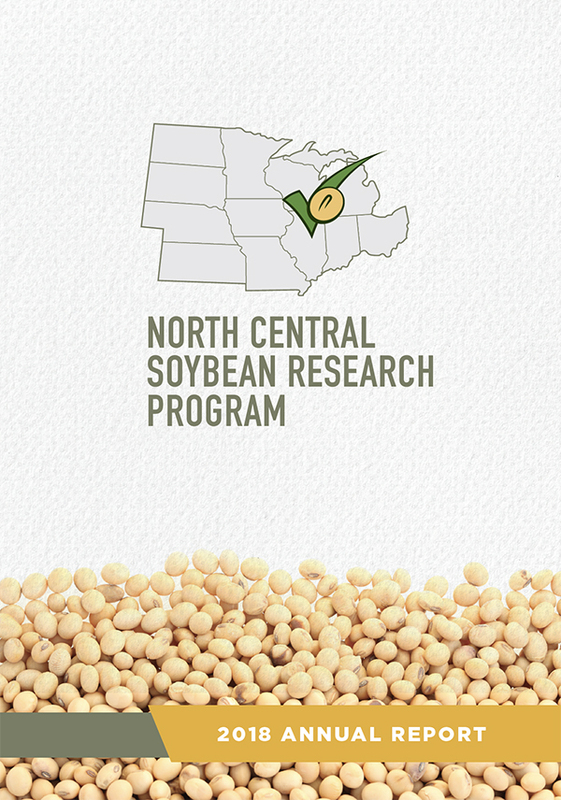 The development of new virus-resistant or tolerant varieties is an active area of soybean research and plant breeding. Resistance genes for BPMV are not known to exist in cultivated soybean, but have been found in closely-related species. Some currently available commercial cultivars have been shown to have tolerance to BPMV infection, in that they consistently yield better in the presence of BPMV than other varieties. Some resistance has also been found in germplasm and breeding lines. Genes for resistance to infection by AMV and TSV have been identified in soybean. Resistance to TRSV has been identified in Glycine soja but is not known in the cultivated soybean, Glycine max. Many studies have shown that insecticidal control of vector insects reduces the amount of feeding by insect vectors, but it does not provide consistent reduction in the incidence of virus infections. In the case of the soybean aphid transmitting SMV, foliar applications of a pyrethroid or organophosphate timed to suppress soybean aphid populations still does not eliminate the potential impact of the numerous aphid species immigrating into the soybean field, including spring migrants of the soybean aphid, from transmitting the virus. In the case of BPMV prevention, current recommentations are to consider early-season insecticide treatments only if BPMV has been confirmed in your fields in previous years and bean leaf beetles are present. Symptoms of virus diseases look similar. But because of the specific plant-insect-virus relationships involved, effective management requires accurate knowledge of which virus (or viruses) are causing the most prevalent virus problem. Most diagnostic clinics in the north central region can perform serological diagnostic tests if a virus infection is suspected. Send in green, symptomatic leaves. Symptoms of alfalfa mosaic virus in soybean. 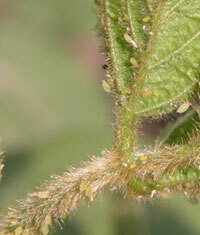 Most soybean viruses are spread by insect vectors, such as the soybean aphid.